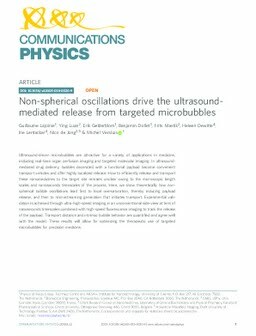 Ultrasound-driven microbubbles are attractive for a variety of applications in medicine, including real-time organ perfusion imaging and targeted molecular imaging. In ultrasound-mediated drug delivery, bubbles decorated with a functional payload become convenient transport vehicles and offer highly localized release. How to efficiently release and transport these nanomedicines to the target site remains unclear owing to the microscopic length scales and nanoseconds timescales of the process. Here, we show theoretically how non-spherical bubble oscillations lead first to local oversaturation, thereby inducing payload release, and then to microstreaming generation that initiates transport. Experimental validation is achieved through ultra-high-speed imaging in an unconventional side-view at tens of nanoseconds timescales combined with high-speed fluorescence imaging to track the release of the payload. Transport distance and intrinsic bubble behavior are quantified and agree well with the model. These results will allow for optimizing the therapeutic use of targeted microbubbles for precision medicine.